Despite its simplicity, these poached eggs on tomato sauce is one of the most delicious, comforting foods I’ve ever made. You already know that I find golden, gooey egg yolks to make everything taste better. 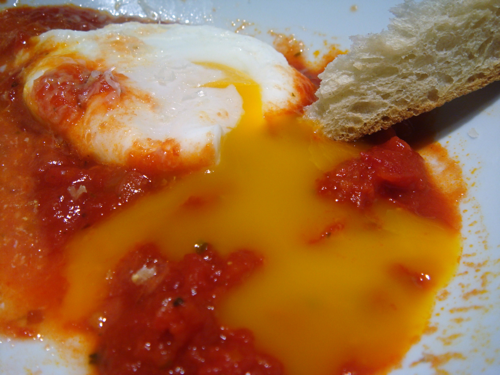 But when I used my crusty bread to pierce the yolk and soak up a mixture of egg and tomato, the sauce transformed into something dramatically more decadent. This concoction was so delicious that I’m dying to make it for friends, but I’m too embarrassed to eat it in front of them because I just can’t resist licking my plate clean. Even Stella gave me a side-eye. 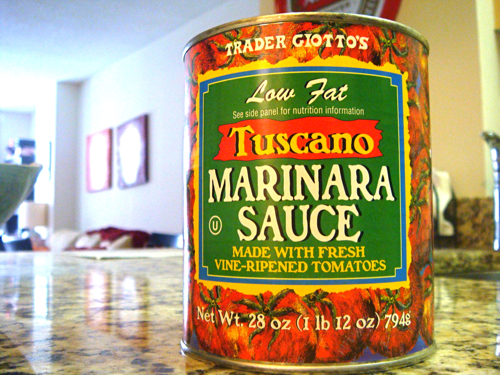 I started off with a can of marinara sauce from Trader Joe’s. You can start with plain tomato purée and add your own seasonings if you want, but I found this to be faster and easier. 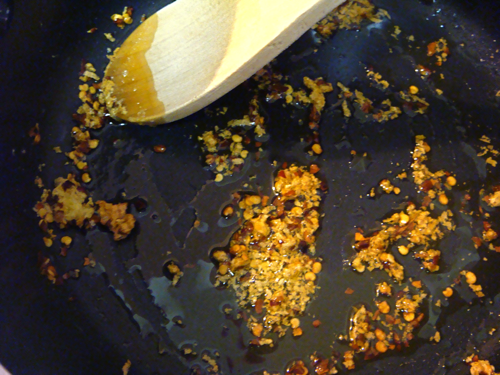 Still, I wanted the sauce to be a little spicier, so I let some minced garlic and red pepper flakes brown in some olive oil first. Then, I added the can of tomato sauce to the pot and let it simmer. 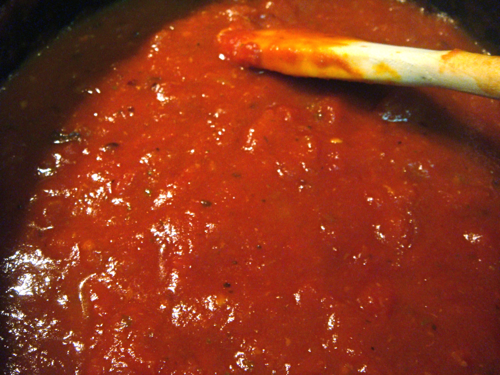 Let your tomato sauce simmer away until it starts to thicken. This should take about 10 minutes. In the meantime, bring a second pot of water to a simmer so you can poach the eggs. I like using Julia Child’s method for poaching eggs. She recommends cracking your egg into a separate bowl, and then gently pouring it into the simmering water. Once the egg is in the water, use a wooden spoon to gently hold the egg white together to prevent it from getting wispy and turning into egg drop soup. The fresher your eggs are, the easier it is to prevent your egg whites from feathering. You should also use the wooden spoon to make sure your egg isn’t stuck to the bottom of the pot. After a minute or so, your egg whites should be firm. 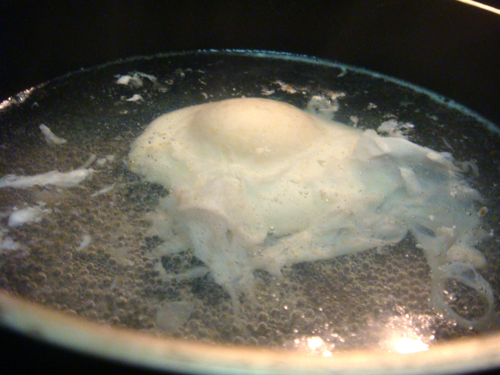 Then, use a slotted spoon to gently lift the egg out of the water. 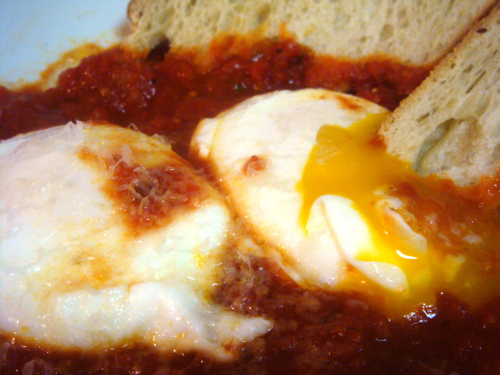 I put my eggs on top of the simmering tomato sauce to stay warm while I poached the others. After your eggs are poached and your sauce is thick and warm, transfer some sauce to a serving plate and put the eggs on top. You can top the eggs with some parmesan cheese, or anything else you like. Don’t forget to toast some crusty bread for breaking your eggs and soaking up the sauce. I hope this quick breakfast/lunch/snack makes you feel as happy and content as it made me! This particular recipe was inspired by Smitten Kitchen, but I have another version that I’ll share with you once I can get my paws on a beautiful box of heirloom tomatoes. if you havent made shakshuka yet you HAVE to. i made it all last week for dinner and its amazing…cheap, comforting, and all you need to do is get the sauce to a simmer before you add the egg in again to poach it before you eat! That’s gorgeous. We just saw something similar on a cooking show!